"Special Olympics has taught me to be brave in whatever happens in my life!" This poignant statement from the Special Olympics Orange County Athlete of the Year, Rebecca Nerney, illustrates that through the power of sports, people with intellectual disabilities discover new strengths and abilities, skills and success. She finds joy, confidence and fulfillment on the playing field and in life. When asked what being named the Special Olympics Orange County Athlete of the Year means to her, Rebecca replied, "Orange County Special Olympics has been a part of my life for 40+ years. It never even crossed my mind that I would be nominated for Athlete of the Year. I am so honored!" Over these forty plus years Rebecca has competed in eleven different sports and traveled all over the globe to represent the Orange County Region making lifelong friends out of the many athletes, coaches and volunteers she has met along the way. This proud and compassionate woman went on to say, "I feel that all the Orange County Special Olympians are athletes of the year! I am just representing them." The Betty Belden Palmer Outstanding Orange County Athlete of the Year award is bestowed upon the athlete who exhibits the values expressed by the mission of Special Olympics Orange County. We are proud to announce the 2016 Betty Belden Palmer Outstanding Orange County Athlete of the Year winner is Debi Anderson. Meet Debi Anderson. Working with young children is one of Debi’s passions, the other is Special Olympics! 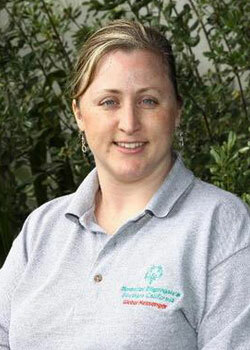 Debi has been involved with Special Olympics for 18 years and currently competes in gymnastics and volleyball. In 2010 she represented Special Olympics Southern California at Capitol Hill Day in Washington D.C., and later, became an official Special Olympics Global Messenger. She just began her second term as an athlete representative and Board Member on the Special Olympics Southern California Board of Directors. She is also a Board Member and World Games Global Messenger for the 2015 Special Olympics World Games which were held in Los Angeles this summer. Debi receives work experience through a program called Real Challenges, Inc. and works as a teacher’s aide at Rose Drive Elementary School in Placentia. In her spare time, she helps with childcare at her church and enjoys acting and dancing. She has appeared in 40 productions with Stagelight Family Productions Community Theater in Brea. Community service is important to Debi as well. She is an active member of Beta Sigma Phi (an international philanthropic sorority) and the Kiwanis-sponsored Aktion Club (service organization for adults with special needs). 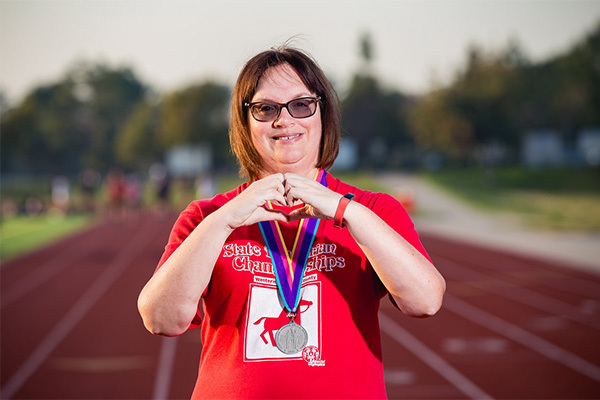 Special Olympics has meant so much to Debi. Her favorite Special Olympics moments have been winning her first gold medal in track and field and the first time she flipped over the high bar in gymnastics.